The Fanwood station as viewed from the pedestrian overpass on a winter afternoon. 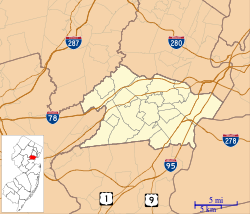 Fanwood is a New Jersey Transit railroad station on the Raritan Valley Line, in Fanwood, Union County, New Jersey, United States. The building on the north side of the tracks (westbound platform) is a Victorian building and, like the north building at Westfield, is used by a non-profit organization. The address is Fanwood Station, 238 North Avenue, Fanwood, Union County, New Jersey. The ticket office is in the station building on the south side of the tracks (eastbound platform). The station was added to the National Register of Historic Places on July 17, 1980. The original station was built a quarter mile to the north and called Scotch Plains station. That station was put in service in 1837 by the Elizabethtown and Somerville Railroad which had completed the line from Elizabethport to Plainfield by that time. Modern day Midway Avenue occupies the route of the old line. The original line had to skirt the hill at Fanwood because wood-burning locomotives of the time could not climb the steep grade. With the advent of more powerful coal-burning locomotives that were able to climb the Fanwood hill, the Central Railroad of New Jersey (which had taken over the line) began to acquire land in 1867 to relocate the line to its current location. The company's charter from the state required the railroad to acquire all the land between the old line and the new line. The land acquired was fan-shaped. The station name was changed from Scotch Plains to Fanwood Park. Besides a new station, the land was developed by the railroad into suburban housing lots laid out on a network of curved streets and called Fanwood Park. The Central New Jersey Land Improvement Company, a subsidiary of the railroad, built and sold houses in Fanwood Park for the next forty years. The Fanwood Station Complex consists of the main station building (1874), the shelter (1897) and the overpass (1946). The station main building was built in 1874 in the popular Victorian Carpenter Gothic style. The station was part of a new line from Westfield to Plainfield and named Fanwood after Miss Fanny Wood, the daughter of a railroad official. 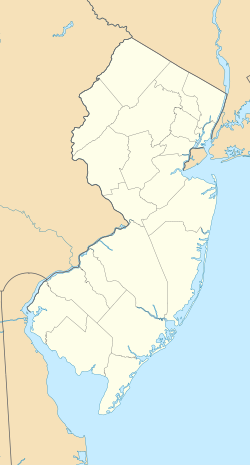 Similar portmanteau names are present in the town of Elberon, named after local property magnate L. B. Brown. The lands surrounding the station became known as Fanwood Park, and the Borough of Fanwood was created in 1895. Several stations were erected in this style. These include Matawan on the North Jersey Coast line (though it lost its gingerbread trim) and Red Bank (restored), and the now demolished/replaced/completely remodeled stations Branchport, Bound Brook, Perth Amboy, Sewaren and Asbury Park. The shelter was built 1897 for the Central Railroad of New Jersey (New Jersey Central) to the designs of an unknown architect in a similar style to the main building. It was designed as a baggage facility and passenger waiting area for the Southside (non-main building) of the tracks. and converted into a temporary commuter sheeted in 1965 when the station was sold to the Borough of Fanwood and converted for community use. The overpass, which bridged two sides of the tracks, was erected in 1946. The station was added to the National Register of Historic Places on July 17, 1980. The station has two low-level side platforms. ^ "Raritan Valley Line Timetables" (PDF). Newark, New Jersey: New Jersey Transit Rail Operations. November 7, 2010. Retrieved November 27, 2010. ^ Bernhart, Benjamin L. (2004). Historic Journeys By Rail: Central Railroad of New Jersey Stations, Structures & Marine Equipment. Outer Station Project. p. 61. ISBN 1891402072. ^ "QUARTERLY RIDERSHIP TRENDS ANALYSIS" (PDF). New Jersey Transit. Archived from the original (PDF) on December 27, 2012. Retrieved December 31, 2012. ^ a b c d e f g h i j Historic American Buildings Survey, (1986) "Fanwood Station, South Side Waiting Room, 238 North Avenue, Raritan Valley Line, Fanwood, Union, NJ," Library of Congress, Prints and Photographs Division, Washington, D.C. 20540 USA. ^ Anderson, Elaine, The Central Railroad of New Jersey's First 100 Years, 1849-1949: A Historical Survey, Easton, PA: Center for Canal History and Technology, 1984. ^ Deed, Union County Courthouse, Elizabeth, New Jersey, book 44/page 319. ^ Homes on the Central Rail Road of New Jersey for New York Business Men, New York: Central Railroad of New Jersey, 1873, p. 24. ^ Bousquet, R. and Bousquet, S.. Scotch Plains and Fanwood. Images of America Series. Dover, NH: Arcadia Publishing, 1995. ISBN 0-7385-6318-8. ^ Conklin, J (July 18, 2011). "Fanwood Station". New Providence Daily Photo Blog. New Providence, New Jersey. Retrieved 18 July 2011. This page was last edited on 27 February 2019, at 09:07 (UTC).